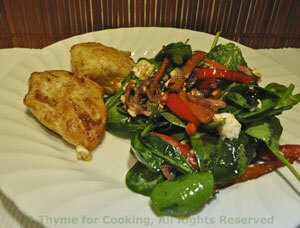 Chicken With Spinach, Red Pepper Salad, quick, easy gourmet recipes. I don't often cook with orange juice but we always have it in the fridge for breakfast. If you don't, use lemon juice and sugar. We'll be using the rest of the feta cheese next week. The Parmesan gets very brown and crunchy. Finish with a light sprinkling of good sea salt. 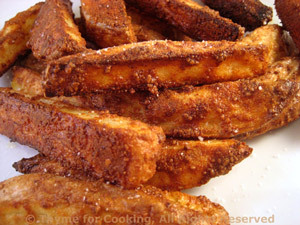 Cut potatoes into sticks - about 1/3 inch (1cm square), no need to be precise. Put oil, garlic, Parmesan in a bowl. Arrange on baking sheet. Bake at 400F (200C) for 30 minutes.